November 11th marks Remembrance Day, the day we pause to think about those who lost their lives in the two World Wars, and in Korea and in the conflicts that have happened since. It’s also the day when we assemble to thank those few remaining veterans for their sacrifice, and to shake the hand of those who are serving today. When I was a child, I went with my mother and sister to the cenotaph in my hometown of Prescott, Ontario, to join the small ceremony. I remember biting winds and leaden skies. The mournful wail of the bugle, and how it touched a deep well of loneliness that I didn’t yet understand but keenly felt. Brief lines of poetry torn away by the wind. The old men in their navy jackets draped in ribbons, with eyes that were so far away. And that long roll call of names. When I moved abroad, I continued to observe those two minutes of silence in my apartment or office. And last year I had the opportunity to observe them in England. Tomoko and I flew to London Gatwick, and took the long slow train to Pershore, a small town in Worcestershire which holds great resonance for my family. There are 41 Canadian airmen buried in the war graves section of the cemetery there, including my grandfather, Air Gunner Sergeant Alton O’Neil. I have only two memories of my grandfather. The first is a second-hand recollection. We were sitting at the kitchen table of my mother’s aunt—her father’s sister—on West Broadway Street in Montreal. Aunt Aileen was telling my mother childhood stories of her father, because my mother never knew him. He was killed in the war soon after she was born. 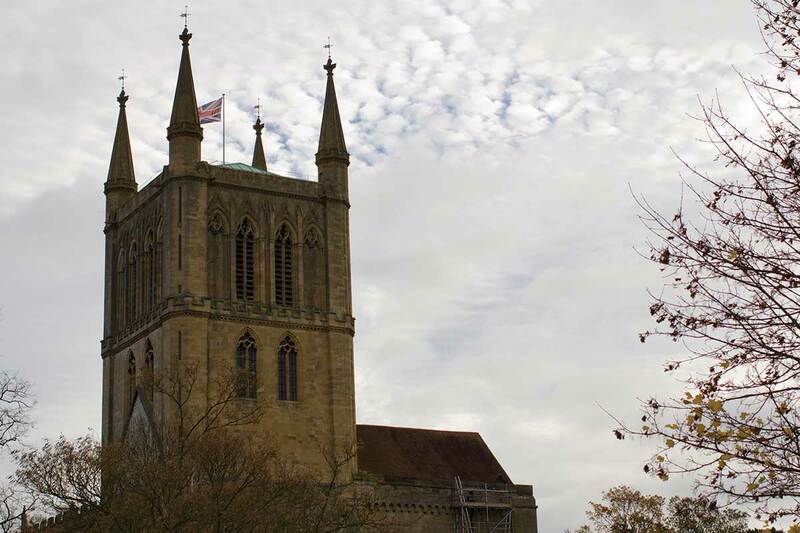 The Tower of Pershore Abbey in Worcestershire, England, under grey November skies. My other memory is of a small box that my mother kept in the safety deposit vault at the Royal Bank. There was a medal, two old photographs, and a telegram printed on very thin paper which simply said, “Killed overseas.” There was no other information on where or how he died. And until four or five years ago, that was all any of us knew. We found out in 2011 when my cousin Charles happened to see a CBC news story about a small village in England that was naming six local streets after fallen Canadian servicemen. Charles got in touch with the local Royal Naval Association Secretary Trudy Burge, who keeps an excellent website dedicated to the war dead buried there, and he flew over for the service back in 2012. Tomoko and I attended an early ceremony next to the abbey that was held especially for the local schoolchildren. They turned out in such large numbers, and we watched as they read passages about the meaning of Remembrance Day, and laid wreaths to honour the fallen. 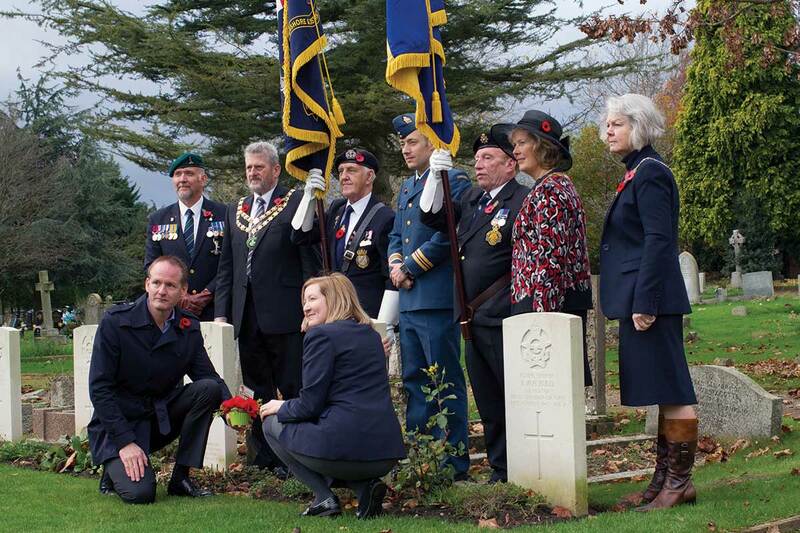 Then we drove to the outskirts of town for the main ceremony at the Pershore cemetery war graves. The local associations and many residents turned out, and a representative of the Canadian Forces came up from London to place a wreath on behalf of our country. I placed flowers on the memorial on behalf of my family, and a small arrangement of poppies on my grandfather’s grave. 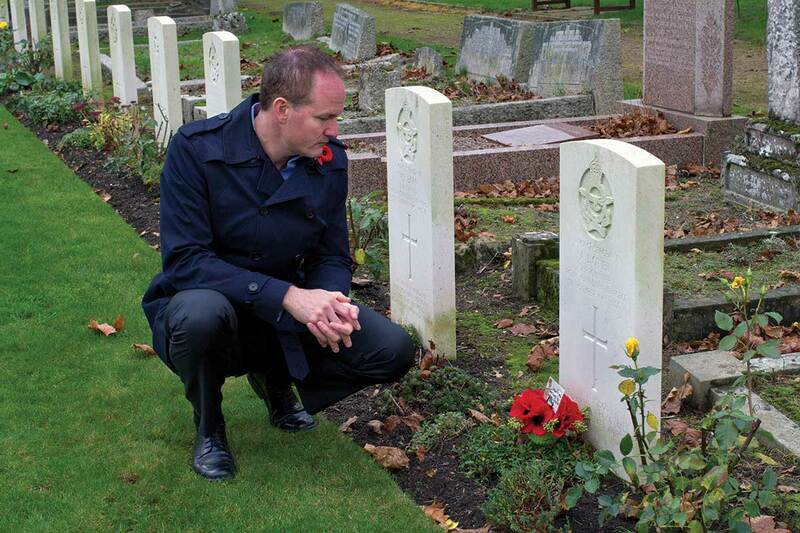 I was also honoured to place poppies on the graves of several other Canadian airmen on behalf of their families. Trudy makes sure that this is done twice each year, on November 11th and at Christmas. She and her father, the late Ted Annis, have done so much to care for the graves of these Canadian soldiers, and to ensure that their sacrifice and their lives are remembered. Ryan kneeling down before his grandfather’s grave. Afterwards, we had lunch at the club of the Royal Naval Association, and we raised a glass with the fine men and women there. Several of them had served in Malta, and they were excited to tell stories about other times in our current home island. We also heard stories about the Canadians who were based in Pershore from men who were just children at the time. Later that afternoon, Trudy and her husband Andy took me for a drive past the abandoned control tower of Throckmorton airfield, the RAF aerodrome where my grandfather and these men had lived. It felt strangely disorienting to visit Pershore. Until then, seeing old photographs of my grandfather was a bit like reading about a character in a book composed entirely of sentence fragments. It had always been difficult to connect a real person to an image of someone I’d never known. 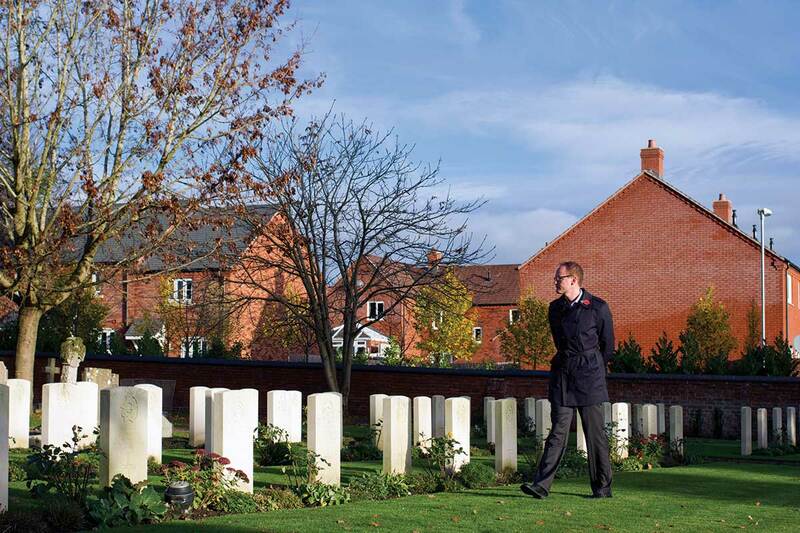 But his narrative was given colour and context after standing beside that long row of graves with their stark white stones, and after standing on the hillside where my grandfather and his crew crashed their Wellington bomber after an engine failure sent them into a stall. The aircraft plummeted to the ground with such force that one of the engines was found years later, nine feet deep in the hill. The entire crew was killed on impact. All five men were Canadian. There’s a small memorial on that same hillside today, with a maple tree and a plaque with the names of the five airmen. On the day we visited, local schoolchildren had left five wooden crosses with poppies at the base of the stand. Witnessing that simple act of remembrance remains my most vivid and emotional recollection of the day. When I see these war graves—all over Europe, and in far flung places like Burma—the first thing that strikes me is the age of these men. My grandfather was 28 years old when he died, and the soldier in the grave beside his was just 18. 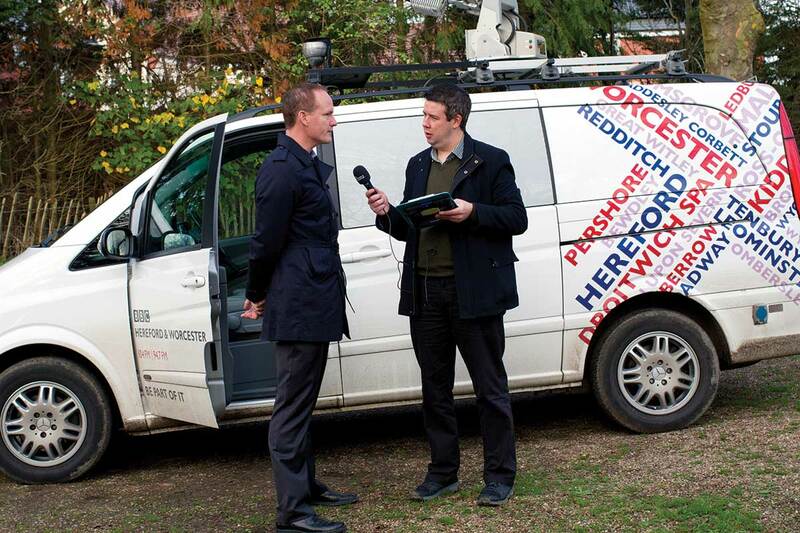 Ryan talking about remembrance with a BBC Radio reporter. I stood there and thought about where I was and what I was doing when I was 28. I had recently finished university, and that was the year I went to Central America and then moved to Japan. I was writing my first book, and my entire life was stretched out before me. But not theirs. They would never know other stages of life, save that of teenagers or young men. I also thought about people like my mother. All those families robbed of a future they should have had. Children like her who never knew their father. Wives whose husbands—sometimes married briefly, and in haste—went away to serve and never came back. Parents whose children’s lives were cut short in their 20s and 30s, along with the future grandchildren they would never know. So many memories vanished with those men. Books that would never be written. Inventions never brought into the world. Discoveries unmade. Futures lost, but willingly sacrificed. I also think of several men from my hometown in Ontario who went to Europe to fight. They told me the war was the most incredible thing that would ever happen to them. They experienced immense trials, but also companionship, excitement, strange cities, love, danger, and a wider world. And then they went back to those small towns and took up jobs as shopkeepers or salesmen. They had families and lived out their lives. But they did so knowing that the life they had lived in their 20s was the most vibrant, exciting, fully alive period they would ever experience, and that nothing like it would ever happen to them again. No one else would understand what they had been through, either. And so they meet each Friday at my hometown’s local Legion, where they tell the same stories again and again with the other veterans. But there are fewer of these men every year. And the most definitive ending comes when there’s no one left to remember. Ryan kneeling with Trudy Burge to lay poppies on his grandfather’s grave. I wonder sometimes if our generation would be capable of their sort of courage? We’re so pampered today, and we live with such a sense of entitlement. Could I go off to fight, like the old man around the corner from the house where I grew up? He was a Spitfire pilot in the Battle of Britain. And when he came home, he went back to his life and never talked about it. It was just something you did because it needed to be done. We owe it to these men to remember their sacrifice—many gave their lives, and others their youth, their health or their limbs. But Remembrance Day is not just some rote thing that we line up to do, putting away our phones out of obligation to observe those two minutes of silence. We remember because these men weren’t just numbers on a list, or just one stone among a vast field of war graves. These were people who suffered. Individuals, each with their own hopes and dreams. Their loss rippled outward to families and communities, and to empty places at kitchen tables, and we honour them by keeping their memory alive. We must also remember what they did, because the job they started is far from over. They passed the baton to us, the generation who came after, and our role is to create a world where that kind of suffering and dying is no longer necessary. These men showed us what we could be, and what we are capable of in our finest hour. Remembering these men as individuals brings home the enormity of their sacrifice. Thanks Ryan, Appreciate your sharing about your experience at Uncle Altons memorial in England. That is how I start my Rememberance each year.. Barry my older brother passed this summer of lingering affects from his Vietnam assignments. May they rest in Peace.